Content by Tony Macklin. Originally published on July 2, 2013 @ tonymacklin.net. Unfinished Song is shameless hokum, but it should please its target audience. 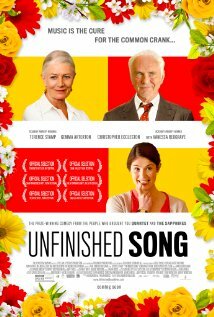 It's about Arthur (Terence Stamp), a grumpy pensioner in London, whose beloved wife Marion (Vanessa Redgrave) has cancer. She has an incredibly sunny disposition as her life sets. She is not only the light of Arthur's gloomy eye, but she is the light of all the rheumy eyes of her singing club. They are taught singing by an upbeat younger woman Elizabeth (Gemma Atherton). She instructs them in hip hop and robot dancing. Seeing old people struggling to move is not the stuff of American Idol. Motivation in Unfinished Song is also robotic. Arthur is sort of estranged from his son (Christopher Ecclestan). He approaches and then pulls away from his confused offspring. Several times. But, of course, Arthur is kind to his granddaughter. When Marion passes, Arthur joins the geriatric singers as they prepare for a competition. He's there, and then he's not, and then he is. Ah, robot dancing. Unfinished Song is one of those films that overuses intrusive music to force out genuine feeling and leads the audience to bury their heads in kleenex boxes. The writing and direction by Paul Andrew Williams are second-rate. His major message is that old age is obnoxious music - he uses violins and piano to punch up the emotion. What saves the film is the acting by two old pros - Stamp and Redgrave. Terrence Stamp started out his film career with Billy Budd (1962) and The Collector (1965). He has a patented blank stare that has worn well throughout the years. In The Collector Stamp's character collected butterflies. In Unfinished Song, he collects moths. But Stamp brings gravity to the old codger in Unfinished Song. Vanessa Redgrave makes her sweet and doddering character into a human being, which is quite an accomplishment. Gemma Arterton with her wide-eyed expression has an Anna Kendrick quality. But, ultimately, Unfinished Song is more hop than hip.